Students will learn about the role of energy through the various habitats within the Lowcountry region through a field trip around Margaret’s Island. A preliminary review is given that identifies the sun as the basis of energy, yet how energy is used, lost and transformed throughout the environment. Through factors such as wind, water (currents), stored energy, chemical reactions and loss of heat. This lesson also observes the degradation of energy within habitats, species and the ecosystem. Student Learning Goals: “I can explain energy flow and can explain how this affects the abundance and distribution of different species.” •”I can demonstrate an understanding of how my choices may have an impact on biodiversity and my world”. Terms: energy, energy memory, storage, maximum power, recycling, primary producers, consumers, ecological succession, disturbance, stability. 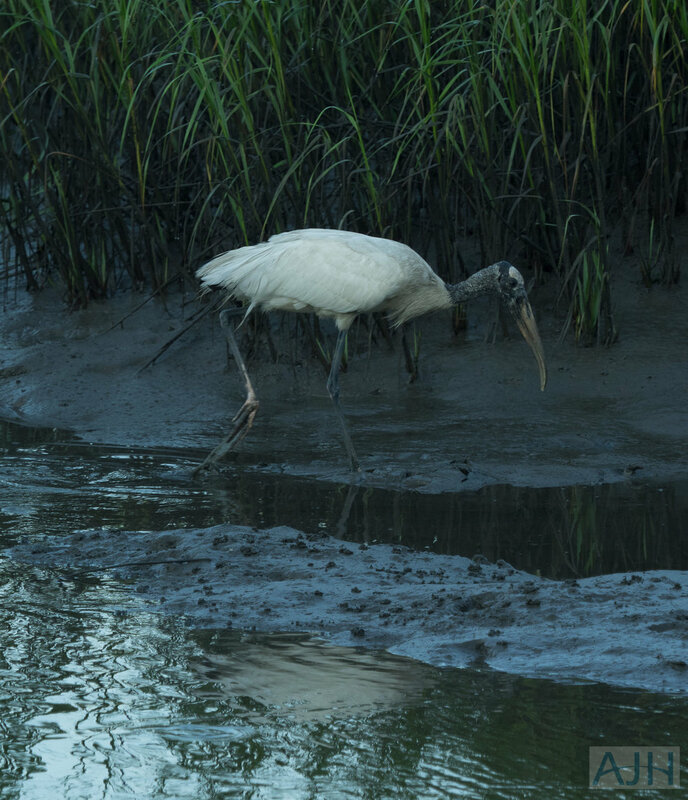 A wood stork (Mycteria americana), foraging in the marsh mud. 8. Environmental Structure & Degradation of Grass into Marsh-mud and its importance to the environment - Length: 1.0 hours, all grade levels, but more advanced content with middle and high school. This lesson introduces and explores the main elements of a salt marsh ecosystem and discusses why it is important to the local environment. The lesson also defines what main species of plants and animals occur in salt marshes and mud. Students visit a tidal creek and collect biological and water samples and and will identify species within marsh habitat. Student Learning Goals: Primary: To see and feel the elements of the marsh at Margaret’s Island. To be able to name and draw some of the animals and plants that rely upon the marsh as a home and for food. Terms: Marsh grass, wrack, plough mud, microbial, crabs, shrimp, fish, detritus, Uca pugnax. 9. Native Plantings on Margaret's Island - Length: 1.0 hours, all grade levels. Some landscaping plants do well in our yards while others require more water or other types of care to survive. This lesson explores how the use of plants that are native to the local environment are better adapted to local climate and weather conditions and how they help support animal species and insects, such as bees, butterflys, birds and other pollinators. Students will visit Margaret’s Island and will participate in review native plants on the island and help plant a small number of new seedlings (under the supervision of my instructors) to support bees and other pollinators. Students will discuss the importance of each planting and how it will benefit the species on the island and its general importance to the environment. Terms: pollinators, fruits, seeds, drought, tolerant, climate, water table, desiccation, succulent.